Taking advantage of dramatic fluctuations of currency exchange rates in recent days some Armenian businessmen increased prices of basic foodstuffs and other essentials that fueled concerns and even created some panic among citizens. Within a week prices for some goods increased by 40 percent, leading to some panic buying at places where prices were not raised and making some stores set limits on purchases of basic foodstuffs like sugar, flour, butter, etc. People compared the situation with the early 1990s when bread and butter were rationed and available to buyers only by ration coupons. “People are afraid of facing the same situation that they already experienced before. Within a few hours prices went up. Coffee and grains, sausages and dairies, meat products, let alone bread – we used to buy bread for 210 AMD, this morning it was 250. The price of one egg went from 70 to 100 AMD, cooking oil prices went from 800 to 1,100 AMD. And all this happens at the threshold of New Year holidays, this is the end of Armenia,” housewife Zhanna Martirosyan, 60, said. The stores that suspended trade and closed in anticipation of stability on the currency market reopened on Thursday as the dram that had hit its historic lows of nearly 600 the previous night rebounded to 460-480. However, no similarly ‘dramatic’ decrease in prices would take place. 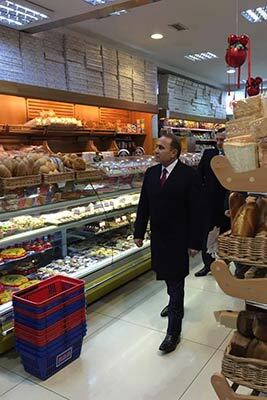 In the afternoon Prime Minister Hovik Abrahamyan visited a number of supermarkets to check the prices and see for himself what the situation in retail trade is. At one of the stores he told reporters that in the case with a number of products there were ungrounded price increases which he said he corrected on the spot. And in the supermarkets he visited there were price “variations” for eggs, which was fixed as well. On Thursday at the government meeting the premier said that the government will not tolerate ungrounded price increases, emphasizing the particularly obvious price increase of sugar, flour and other basic foodstuffs. He instructed Artak Shaboyan, the head of the State Commission on the Protection of Economic Competition (SCPEC), to look into the matter. During the recent days parallel to food prices, prices for medicines also were raised. “Blood pressure and diabetes drugs got more expensive. Now they make us go straight to the other world, don’t they? How can they tease people like this? They are those who import, who sell, who cheat the people, what do they demand from anyone else?” Margarita Hambartsumyan, 55, said. PM Abrahamyan also instructed Health Minister Armen Muradyan to follow trade in the medicines market to understand what is happening in that sector. Meanwhile, many believe that if prices continue to climb up, Armenia may see another wave of outbound migration. Albert Sargsyan from Yerevan believes that what is taking place today will only increase poverty. “I believe all this has a speculative nature. They needed to raise the dollar and they did so, now they lowered it. This is the way the country’s oligarchs get richer,” he said. The price-increase waves had spread across all Armenia. In the second largest city of Gyumri some had stopped wholesale trade in flour and sugar, it restarted only yesterday. In Kapan sugar was sold for 500-600 AMD, instead of previous 420. Buckwheat, grains and flour prices increased by 200-300 AMD. Citizens hope that dram exchange rate stabilization will also lead to price decreases, and closer to the New Year prices will not rise again.